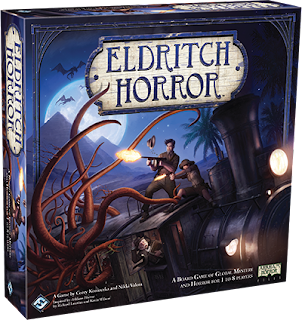 The Eldritch Horror Preview Event is your chance to see and play the upcoming Eldritch Horror board game before its global release. We will have someone on hand to demo and explain the game. You'll be able to play the game and check out its rules and components. We recommend that you come in or call to guarantee a seat at the game. In Eldritch Horror, one to eight players take the roles of globetrotting investigators, who must work together to solve mysteries related to an Ancient One. Along the way, you'll gather clues, encounter strange and mysterious circumstances, battle monsters, and embark on daring expeditions. Do you have the courage to save the world? With terror spreading across the globe, you and your fellow investigators will venture to the fat corners of the world. From the snow-caped peaks of the Himalayas to the bustling streets of San Francisco, you and your group of investigators will travel to the world's major cities, its most remote wildernesses, and everywhere in-between to prevent an impending global catastrophe . . . the awakening fo an Ancient One whose arrival will cast the world into eternal darkness.